"Amarillo Slim" is a 58" black with silver points Jack that is an own son of JenJack. When renowned longtime mammoth breeder Mr. Everett Segelke held his dispersal sale in Colorado, he declared this Jenjack son as "the best jack prospect on the place". 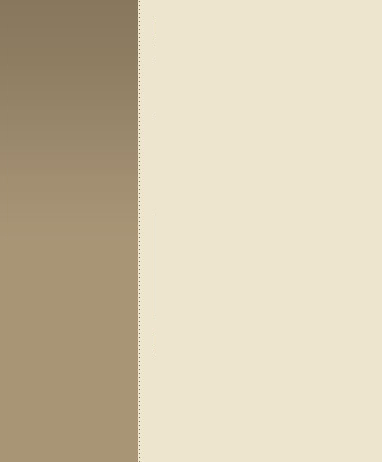 We call him "Mr. Smooth" because he sires very smooth colts that are athletic, good-minded and nice movers. Proven by his breeding, he is an own son of the noted American Mammoth Jackstock Sire "Jen Jack". Proven by his performance, he rides and drives. 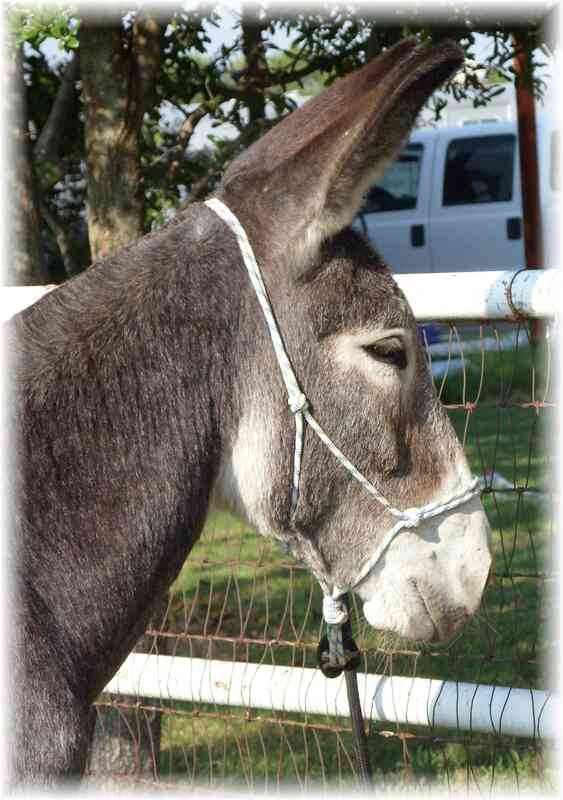 Chosen to lead the American Donkey and Mule Society entry in the Rose Parade. 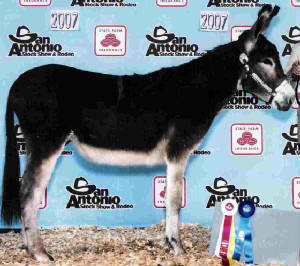 Proven by his show record, he is Bishop Mule Days 1985 World Champion Jack and was awarded Model Donkey at the prestigious Houston Livestock Show in 1986. Proven by his offspring, he has sired many great mules, including multiple World and National Champion mule that excelled in many different performance events. "Dallas Cowboy" - beautiful black with silver points mammoth jack that has solid conformation, a nice short head with a keen eye (no hood over the eye like some of the old time stock), plus suitable bone and foot for his body. 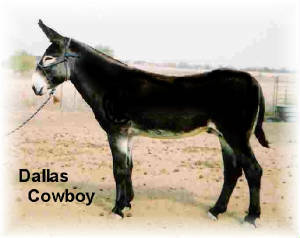 Sire of several successful show donkeys, also has produced many exceptional mules including the winner of the Snaffle Bit Cowworking Futurity at Jake Clark Mule Days. 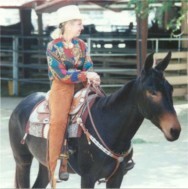 Photo Above - Riding "Tom Horn" bridleless at Bishop Mule Days after winning reserve in a large Western Pleasure class. This was the mule that convinced us that we needed to own his sire "Amarillo Slim". "Tom Horn" has been a wonderful mule for us...a great trail animal and enjoyable companion, he has had a extremely successful show career at the largest shows in the nation. He competed and won in events ranging from Western Pleasure to Reining. As a catch ride, he was exhibited by several youth and amateurs to earn awards at the biggest & toughest mule show in the nation, Bishop Mule Days. 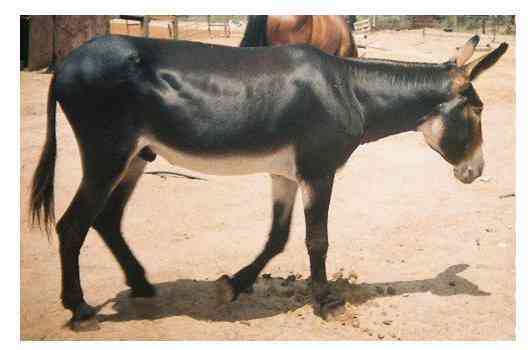 He was Reserve High Scoring Mule in Dressage at the Great Celebration Mule and Donkey Show in Tennessee. September 2009 This is the newest addition to our star line-up of Jacks! We are really excited about him- he has square, balanced conformation, a small head and energetic temperament. We call him "Monogram" because the awesome long mane and full tail will stamp his offspring! "Windchimes Farm Cactus" This Jack is the sought after combination of disposition, balanced conformation and good bone - no coarseness, no big hocks or knees - really fine slick shiny black hair - beautiful head and face - big eye, no hooding...I love this jack...he is a gentle, fun saddle donkey and we are happy he is here at Windchimes Farm. Jack prospect "Silver City" by Amarillo Slim, by JenJack. Out of our good Sunshine mammoth jennet, he is a well-proportioned jack with good bone. Sweetheart personality! He will go into under harness training this fall and we will start riding him as a 3 year old. He will go into our Jack lineup when is a little older.